hahaha... I have to laugh at the title because of the new Terry Tate video that I watched the other day. Noah hasn't wet his pull-up all week so I thought we would try without last night. No accidents! Yay!! So today we went to Wal-Mart and my big boy got a new set of big boy pajamas :) He picked them out himself. He had a hard time choosing between the Hulk, Batman, and Transformers but ultimately Transformers won because he acquired 2 Transformer toys from Heather's house and has been carrying them around for 2 days now. They take baths together, play in the sandbox together, watch TV together, go to the bathroom together... everything. Right now he's pacing the house calling out "transformers, transforrrrrmerrrs" I guess he lost them. Don't worry, he found them. We also got a new winter coat that's 2 coats in one and some warm sweatpants to wear at night. I had another OB appointment today. Everything is going great and the baby is measuring right where it should be. My due date is still May 15th (a Mother's Day baby!). It finally looks like a baby now!! 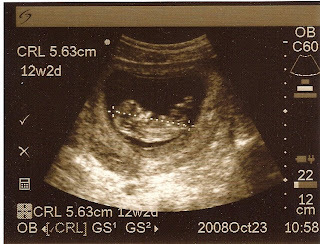 I saw the heartbeat and was even treated to a little swimming demonstration :) Next month we will be able to hear everything and see some major movement from the little bean. No pictures yet, unfortunately. I am still trying to figure out what the issues between my scanner and photoshop are... I wasn't having any problems until I downloaded updates from HP. It's getting really annoying. What's up now, MACaholics?! OK so... we have all been doing just swell over here. Our lovely neighbors gave us their old king size mattress and box-spring yesterday. There isn't anything wrong with it, they just wanted a new one. THANK YOU, GUYS!!! The only downside is having to get everything else king-sized to go with it... bed frame, head board, foot board, sheets, pillows, comforter. But, that's all worth it just to have all the extra room in bed! I didn't get elbowed at all last night :D Now we have a spare queen mattress and box spring that's just hanging out in our closet, perfect for floor-sleeping if need be. 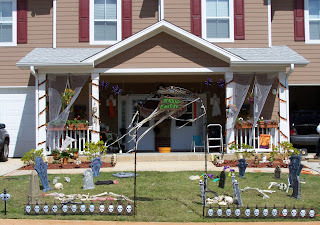 Our neighbors also love Halloween and decorated the crap out of our front yards. I think it looks awesome!! I need to find a way to relieve stress. Josh has soccer and his own little projects. I have nothing. I can only blame myself, I guess. I need to get over the guilt of leaving Josh alone with the kids so I can get out of the house or do something on my own. A while back I did a little post on random things that annoy me throughout the day. I think it's time for another list. Bear in mind I am in the first trimester of pregnancy right now so some of these items are unique to my current experience. 1. The magical draft that wafts in under the bathroom door to blow the shower curtain into you, taking up all the space and being generally annoying... and for some reason the curtain can absorb all the hot water, but remain freezing to the touch. 2. Having to put that one extra item on the shower shelf, knowing full well that you will most likely bump it and have to pick it off the floor every time you're in there. 3. How loud it is when that one extra item does fall into the basin... I KNOW YOU FELL, GOSH!! 4. Forgetting to bring the baby monitor from the living room to my room and having to go back downstairs to get it. We went out to the lakes for a couple hours yesterday before bedtime. There are so many lakes on base it's almost ridiculous. They're all stocked with different kinds of fish and they're surrounded by wide, well cared for dirt paths. 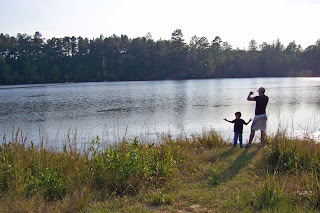 I was trying to get some shots for our October family photo hunt. This month we have to find shapes. I'm happy to say I found most of them! However, I'm not done yet because I still want to see if I can find more seasonal shapes. We need to get out to a pumpkin patch this weekend. Anyway... the boys (including Bosley) all had fun, and so did I. Regardless, the boys are still quite entertaining :) They play nicely upstairs giving me a chance to lay down and relax while they destroy their rooms. I am perfectly fine with that! 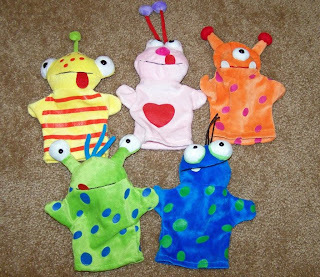 Noah's new ultimate favorite toys (and mine) are the hand puppets we got from the one stop at Target. I love these little monsters!